The kitchen is a natural gathering place in the home. Whether it’s two people sitting quietly with their morning coffee, or a half-dozen eager to get their hands on a tasty meal — the kitchen is the place. This island features a hefty cherry base with three shelves for pots and bowls; and a big dovetailed drawer, accessible from both sides. 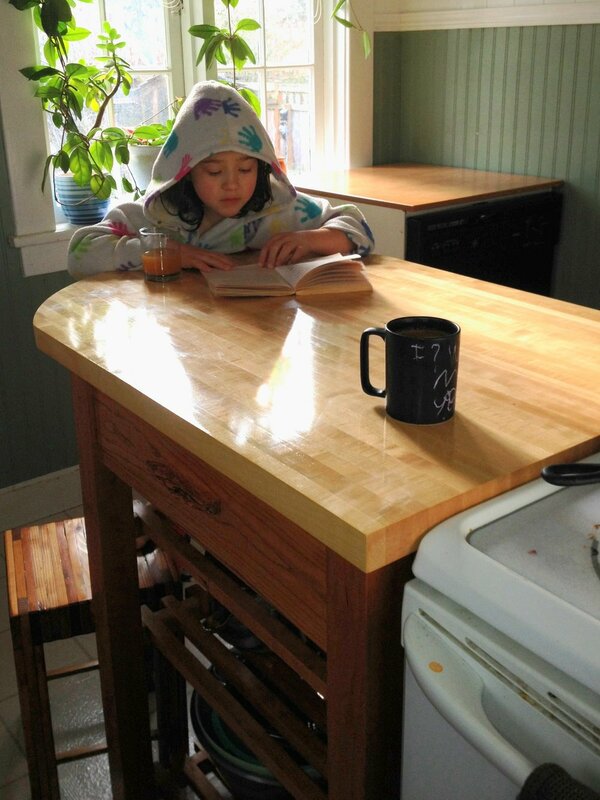 The top is laminated from solid maple and finished with Waterlox for a moisture- and heat-proof finish. One end extends in a comfortable half-circle for sitting on stools (with aforementioned coffee). When it came time to add the drawer handles, I was a bit stumped. I loved the seamless grain of the cherry drawer fronts, and was loathe to cover it up with anything too big. I tried a few unwieldy variations until I spotted a lonely scrap of board with a big piece of included bark. By carefully splitting along the bark I came up with two unique drawer handles. After a bit of ergonomic tapering and some polishing they were perfect!